Most of the energy we use can be eventually attributed to sunlight. The gasoline in our cars is ultimately the result of photosynthetic plants converting carbon dioxide into sugar with sunlight millions of years ago. Even the energy from a hydroelectric plant can be traced back to light. The sun evaporates ocean water which then precipitates as rain and snow in the mountains to form the rivers and lakes behind the hydroelectric dams. Speed Kim Nicole Adriana M.
Light Sally Marco Alex W.
produce a cyanotype print suitable for use in a jigsaw puzzle. explain how the interaction of light and matter produces color. write the chemical formula for Prussian blue and assign each atoms' oxidation state. create the Illustrator file needed to cut a jigsaw puzzle pattern with the laser cutter. write an explanation of how a type of energy "works" that a 5th grader can understand. assemble a professional quality jigsaw puzzle from a cyanotype print. explain the cyanotype process in detail. evaluate and critique puzzles produced by your peers. By the end of the week, each group of 3 must create a jigsaw puzzle using a energy themed picture printed with the cyanotype process. While many of the required tasks can be done in parallel, others depend on other things being completed first. The week outline below is a rough idea of what you should be doing each day to finish by Friday. At the beginning and end of each day, Dr. Don will address any problems and answer questions to the class as a whole. At any time, group leaders may request help from Dr. Don or from other groups. This is not a competition - help each other. It is each group's job to organize their week so that they can produce a high quality product on schedule. The roles below will help insure everyone contributes equally to the project. In addition, someone must also serve as the group leader (it doesn't matter who, you can choose the leader randomly if you like). The leader's role is to make sure that everyone is on task and has the resources they need to do their tasks. Regardless of the role assigned, everyone should help out as needed to make the final product the best quality possible. Review and critique each other's work. Your grade will depend on their quality of workmanship. The Jigsaw puzzle is a "sandwich" of two layers of 1/8" hardboard no larger than 8" by 10". The bottom layer is a solid rectangle exactly the same size as the jigsaw puzzle. 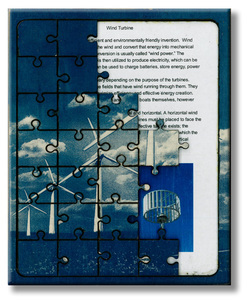 The top layer contains the jigsaw pieces cut out of a rectangular frame. The frame and bottom layers are glued together. The underside of the puzzle pieces and the top of the bottom layer are painted identical colors so the puzzle pieces can be easily associated with their respective puzzles. The cyanotype picture should be large enough to cover the entire puzzle (pieces + frame). A few paragraphs (at a 5th grade reading level) describing how this picture relates to energy is decoupaged to the inside of the frame. Is the print clear and properly exposed? Does it look professionally assembled? Does it conform to the product description? Can a 5th grader recognize the type of energy in the picture? Is the written description grade level appropriate (interesting and understandable) and technically correct? Did everyone complete their tasks on schedule? During individual down time, did the idle student help others in their group (or other groups)?